Dragon Quest has always been a huge hit in Japan, but has never quite managed to capture the same attention elsewhere. 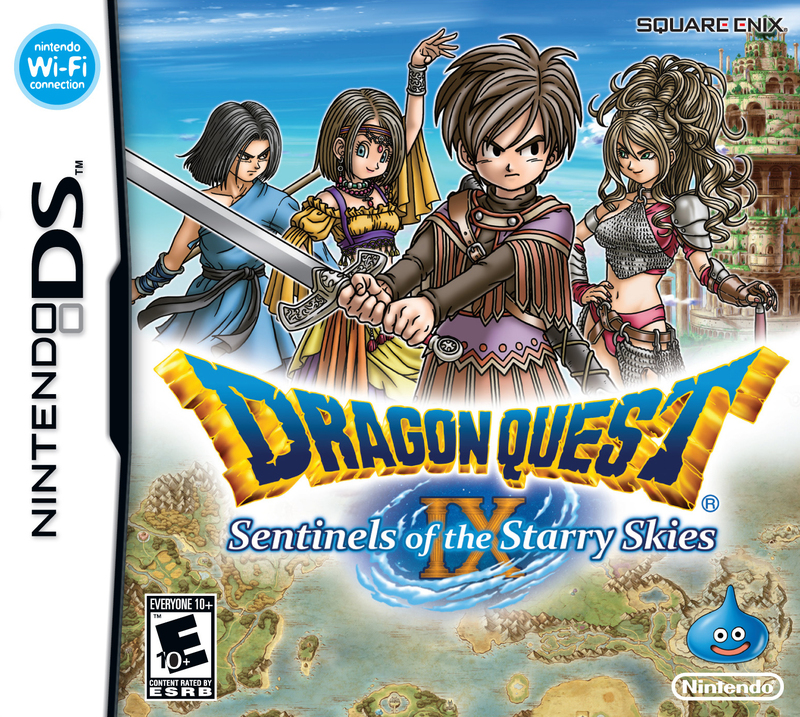 It seems more likely, in comparison to past DQ games that the release of Dragon Quest IX: Sentinels of the Starry Skies will lead to greater worldwide success. 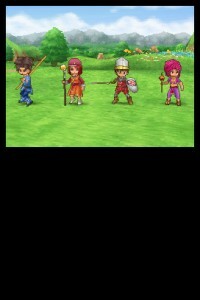 Never before has a primary Dragon Quest game been released on a handheld – in fact, it is designed for the best-selling portable video game console of all time. Moreover, the title features a mix of classic role-playing gameplay as well as a few new additions and modifications that make this particular title a worthy addition to the series. From the outset, you are provided with the opportunity to create your own character who will become your main hero for the adventure. Numerous appearance options are available, including body type, face appearance, and gender. Because the process is effortless, it is easy to create your own character relatively quickly. After you’ve created your character, the game places you in the role of a guardian, a Celestrian angel who has been put in a position of overseeing a mortal village. Your influence on the community has great impact, as the good actions you carry out produce Star Auras. After performing a few additional positive actions in the game, enough of the essence is gathered for the World Tree, Yggdrasil. In return, it bears magical fruit – a key event, which triggers the arrival of the Starlight Express, allowing the angels to travel to the Realm of the Almighty. Yet even though everything proceeds as planned, an unforeseen event occurs. The Observatory – home of the angels – is attacked by an unexpected, enigmatic power, causing you to tumble down from the heavens along with the Starlight Express and newly produced fruit. To make matters worse, many of your saintly powers have disappeared and it appears that there is no easy way to return from where you came. 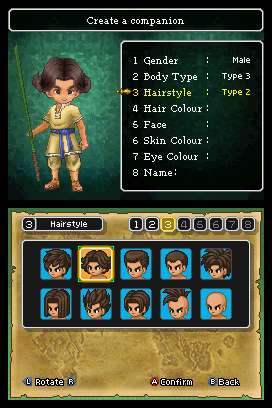 For the most part, Dragon Quest IX plays like a standard RPG. 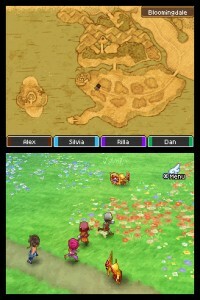 There is a sizeable overworld to explore while traversing to different towns as well as to other areas in the game. Enemies populate the field and dungeons; however, unlike previous games in the series, random battles have been removed for the most part in favor of visible encounters. This is a much welcomed change, as it cuts down on unwarranted bouts. Nevertheless, one needs to keep in mind that although you can usually pick and choose your fights, some monsters will chase after you if you come too close. In addition to the removal of random battles, Sentinels of the Starry Skies is also quite a bit different than past games in terms of party formation. You can choose from randomly generated characters based on different vocations – also known as classes. If interested, you can also create your own characters by completing the identical process made available for your hero. While this is fairly novel for the genre, it isn’t exactly the most ideal scheme for an RPG. Because the party members are unique to each player’s games, they are devoid of character development. It appears as though they are nothing more than nonessential battle fill-ins, irrelevant to the development of the game’s story. They don’t speak, nor do they participate in cut-scenes. On the bright side, there is an ample number of very memorable bubbly, non-playable characters who ooze with personality. Even though party creation is new to the series, Dragon Quest IX does maintain a conventional battle system. As is customary in turn-based RPGs, there are commands offered such as “defend” and “flee.” Not surprisingly, you can perform a straightforward attack with an equipped weapon, cast a spell, use an item, or make use of one of your abilities. A dynamic camera keeps the action engaging – different perspectives and angles are shown throughout the fight, and sometimes the focus is shifted between different characters. Strangely, the greatest amount of experience points is awarded to the person who possesses the highest level. This isn’t a huge issue, but it does cause uneven leveling. Graphically, Dragon Quest IX is quite remarkable and is, most definitely, one of the most visually pleasing DS titles available. The game world is fully rendered in 3D, though numerous NPCs are represented in sprite form. The graphics are bolstered by a pleasant art style as well as fantastic design. There is considerable focus on detail as well, which you’ll notice early on. Each piece of clothing chosen changes your character’s appearance for both the main hero and party members – and can be instantly seen in the game. Unfortunately, perhaps as a result of the impressive graphics or the DS’ dated hardware, the title struggles to maintain a solid frame rate. There are constant issues with slowdown if you have a party of four. Although the decrease in frame rate does not directly impede on gameplay, it is, nevertheless, noticeable and can occasionally be bothersome. There is a ton to see and do using the game’s main single-player adventure, but there’s also plenty of fun to be had when utilizing the title’s local wireless mode, which offers some of the best multiplayer action on the DS. You can join together with up to three other players to participate in the host’s game world. This mode is extremely impressive because it offers a tremendous amount of freedom to all participants. Players can drop in and out of the game seamlessly, and then each participant is mostly free to do what he or she wishes. Moreover, players aren’t restricted to particular areas. Of course, there are some limitations. The one shortcoming when using the robust mode is the limited functionality of local wireless play. If you were planning to join an online friend – forget it, it’s just not possible. 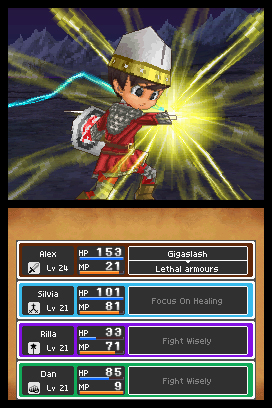 As one would expect, considering the nature of such an RPG, Dragon Quest IX offers tremendous replay value. Besides the game’s lengthy single-player adventure and multiplayer mode, there is a profusion of sidequests to challenge players – some of which come in the form of a consistent stream of weekly downloadable content – item-making to experiment with through alchemy, achievements to earn, and different vocations to try out. 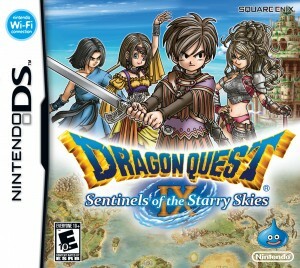 Dragon Quest IX: Sentinels of the Starry Skies is the ninth entry in the main series, yet it will probably be the first title that many gamers purchase. But, perhaps it’s the perfect title to start with thanks to its easily approachable gameplay. The title features an abundance of content that will keep players busy for hours on end, and, for the first time, it allows players to share the adventure with others. Although Dragon Quest IX doesn’t deviate greatly from the mainstream RPG formula, it does provide a very enjoyable gaming experience. Review copy provided by Nintendo/Golin Harris.